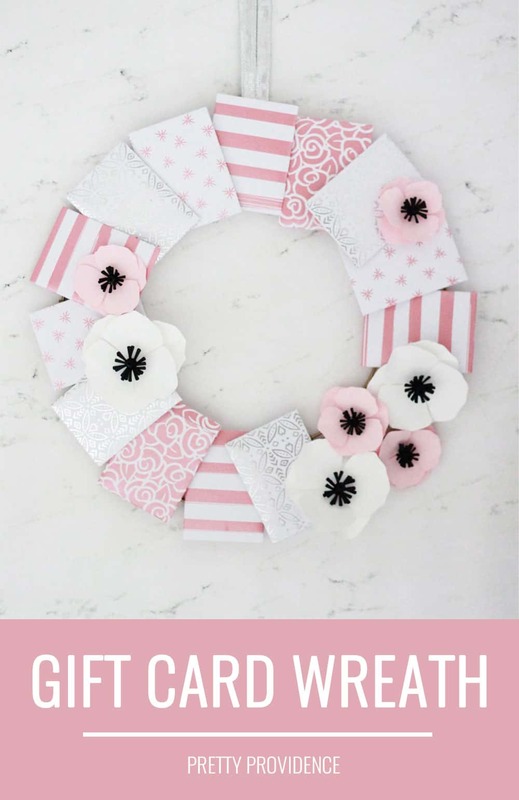 If you are looking for fun way to give gift cards, TRY this gift card wreath IDEA! Gift cards are one of my favorite things, you guys. I know some people don’t love to give gift cards because they feel like it isn’t personal or thoughtful, but I totally disagree. Especially if you go to the effort to choose a gift card to somewhere that the person you’re buying for LOVES to shop or eat at. It’s the gift of an experience! One thing that is kind of a challenge though, is wrapping the gift cards. You can put them in a card, but sometimes you want to do something a little different. That’s where this gift card wreath comes in! 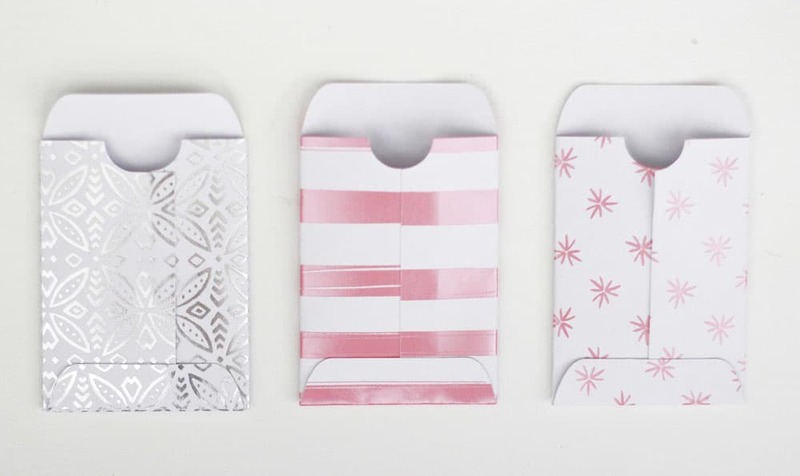 I just got the new Cricut Explore Air 2 Wisteria bundle, and I wanted to use it to make some awesome gift card holders. 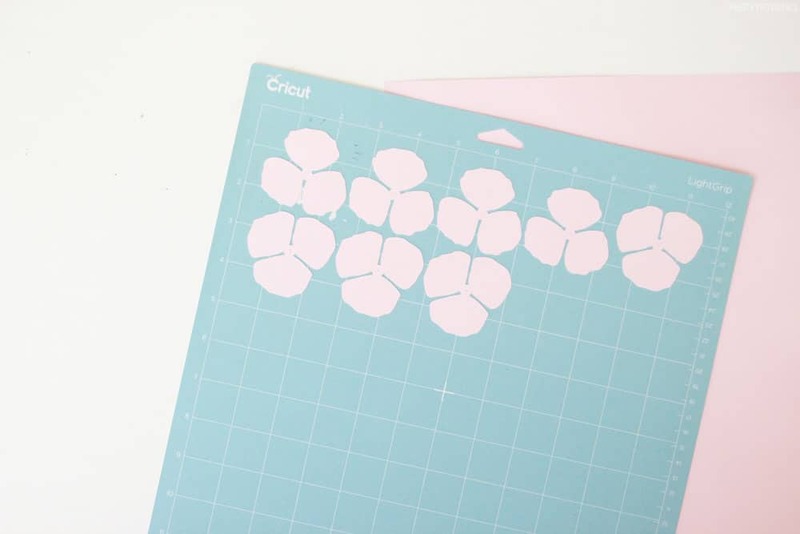 To anyone unfamiliar with Cricut bundles: they are basically a sampling of really fun materials that come with the machine! 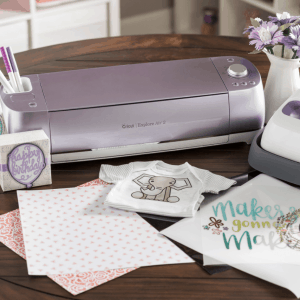 This Wisteria bundle is full of sparkly things like holographic glitter Iron On, a foil-embossed paper pack, exclusive Iron On designs, and some of the new SportFlex Iron On. It’s really great to have a variety of things to try out when you get a new machine. 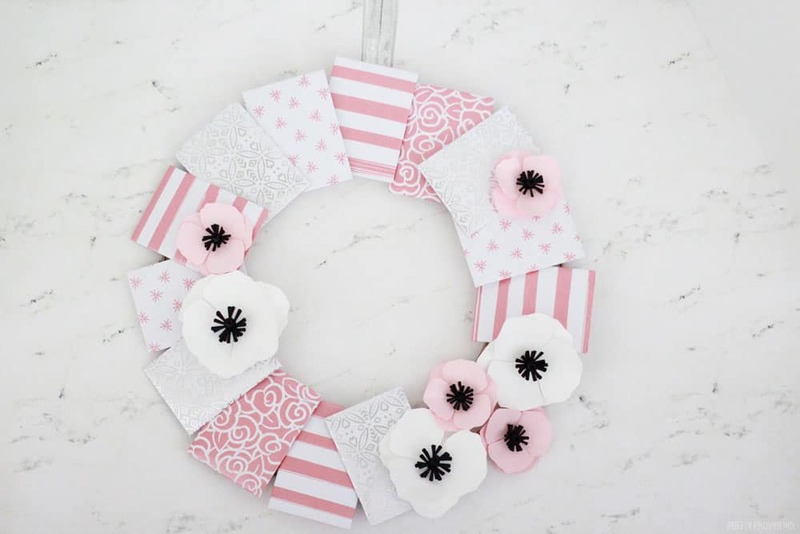 I thought it would be fun to make a wreath out of little gift card envelopes. Some of them have gift cards in them, the others have notes inside with things that you love about the person, or Thank You notes for different things, that kind of stuff. I made the gift card envelopes with foil embossed paper and I cut some paper flowers to embellish it with as well. 4-5 variations of card stock. 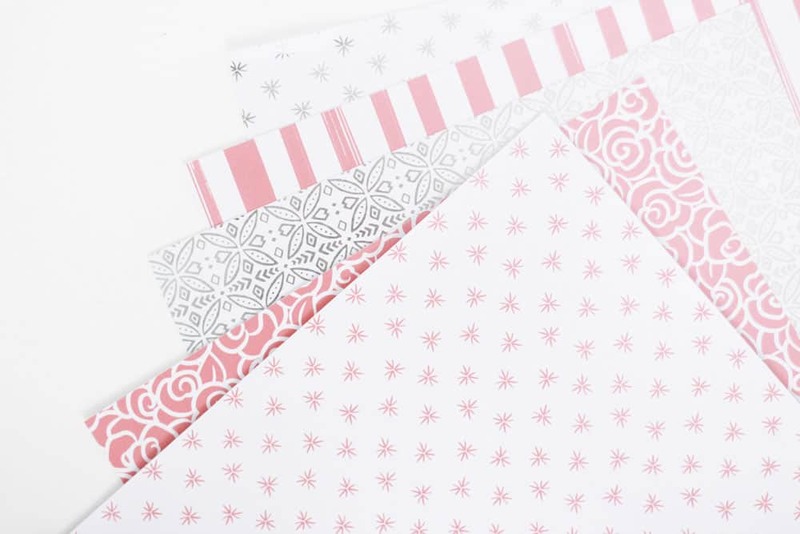 I love these pink and silver foil papers that came in my Wisteria bundle! 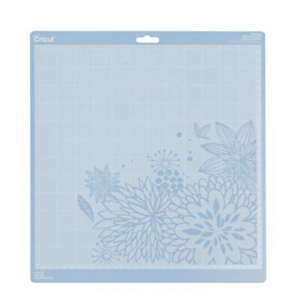 Place a piece of card stock onto a light grip cutting mat & load into your Cricut. 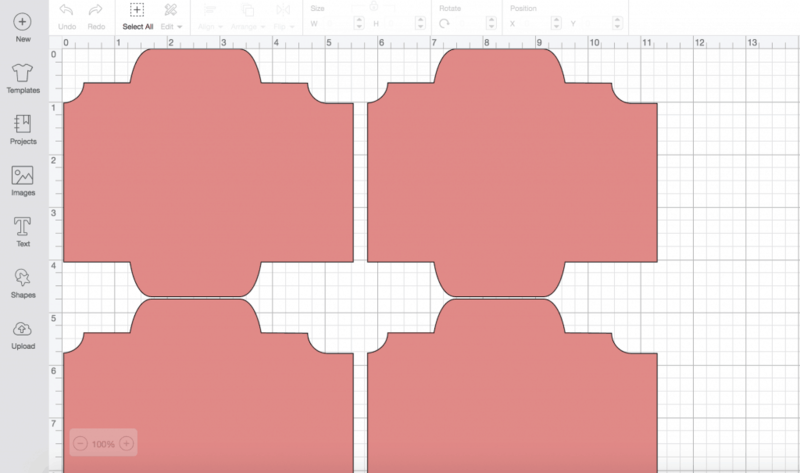 Load this gift card envelope template into Cricut Design Space. Make sure your machine is set to Card Stock. Repeat this until you have 12-16 gift card envelopes cut. 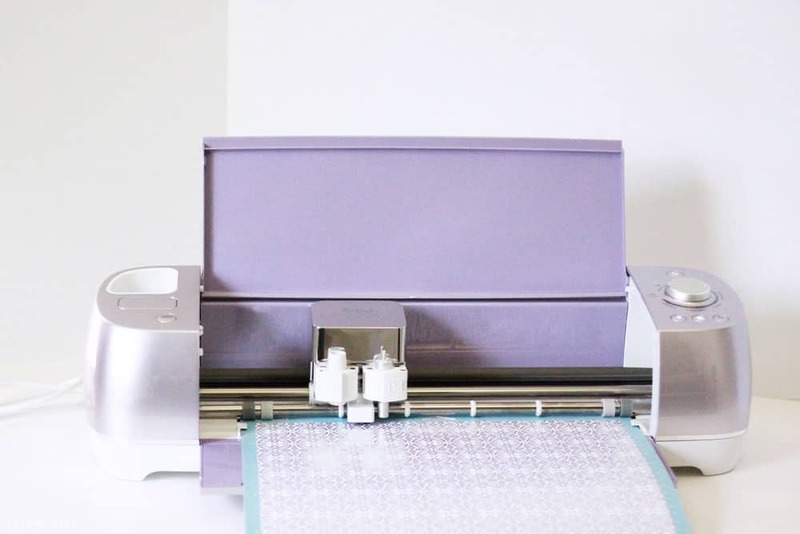 Quick sidenote: can we talk about this beautiful new Cricut Wisteria Explore Air 2? It’s shimmery and purple and I just love staring at it. I actually have it displayed on my bookshelf because it’s so pretty! It’s available exclusively at JOANN. 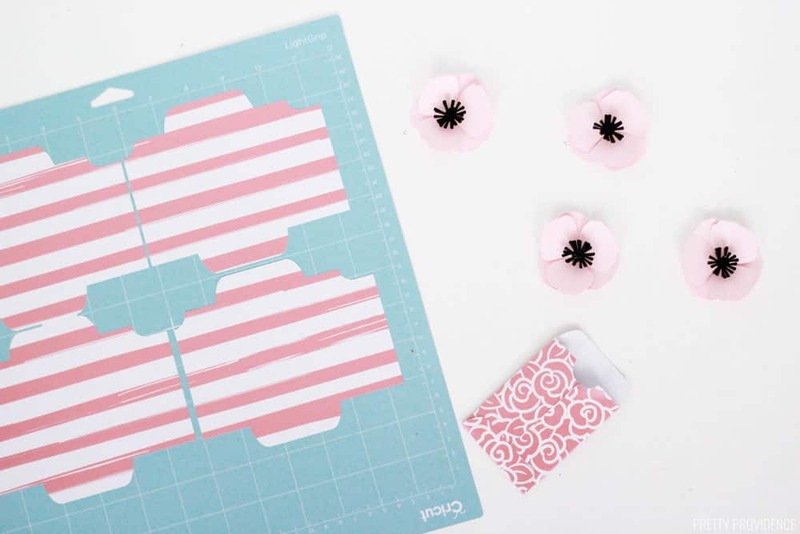 In Cricut Design Space, go to Images and search Poppy #MA3E13 – this is included if you have a Cricut Access subscription! Cut! Repeat this step again for the pistils. 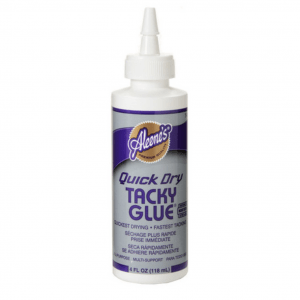 Roll the pistils up and secure with tacky glue as you go. Bend the petals and glue it all together. 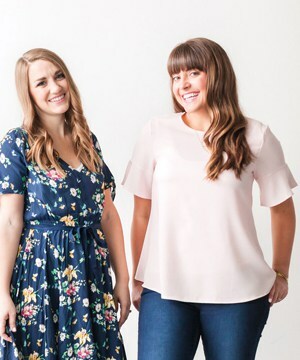 Fill gift card envelopes with gift cards and sweet notes for your person. 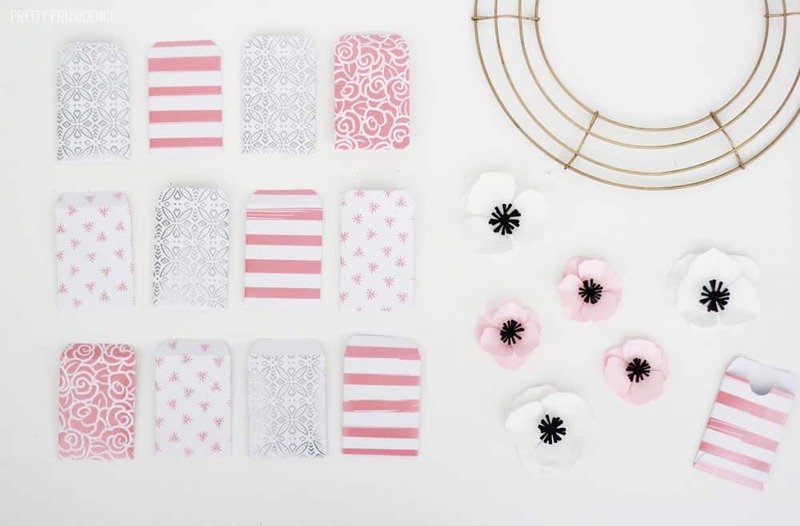 Use glue dots to close the envelopes. 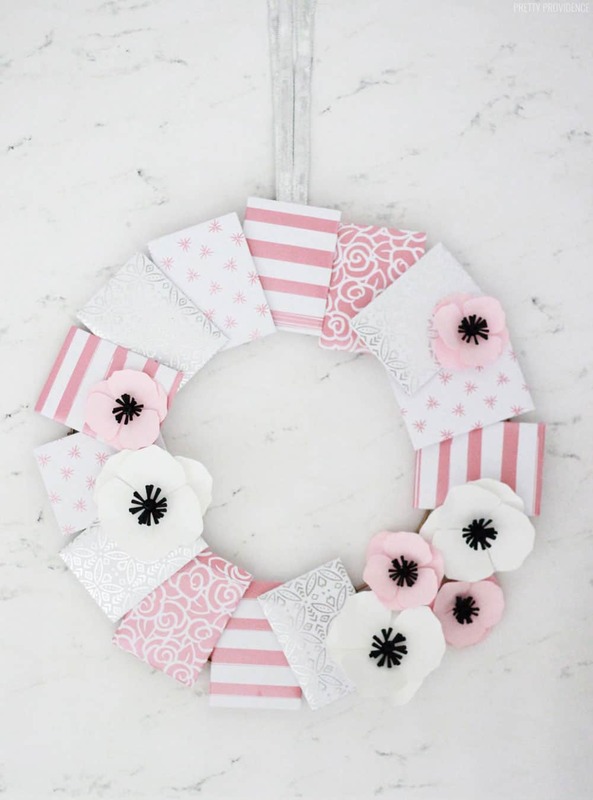 Arrange the gift card envelopes on the wreath form until you like the pattern, and add paper flowers too. 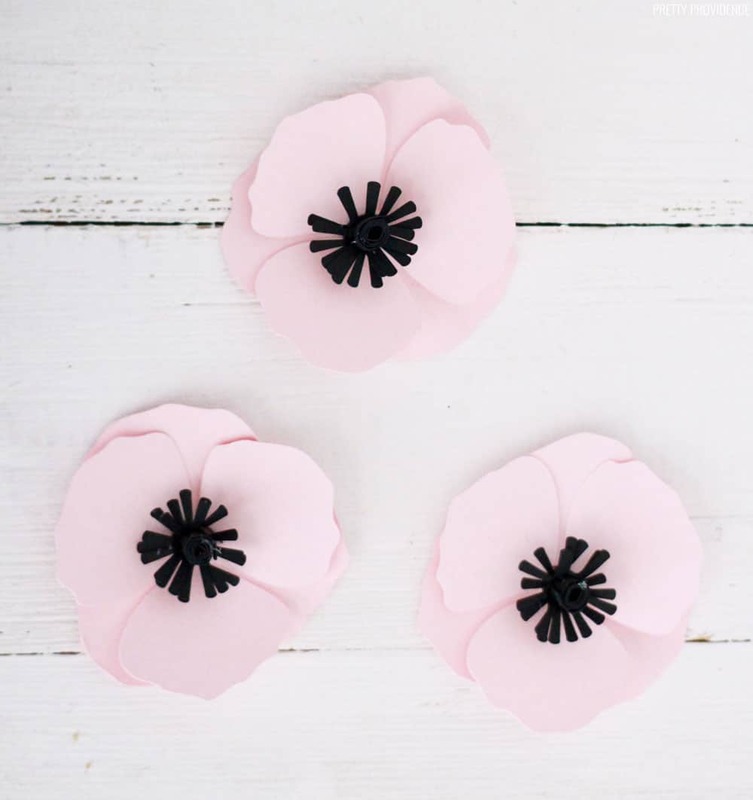 Use tape to secure the flowers too. 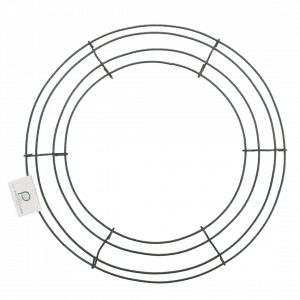 Add ribbon for hanging the wreath. Sooo fun, right!? 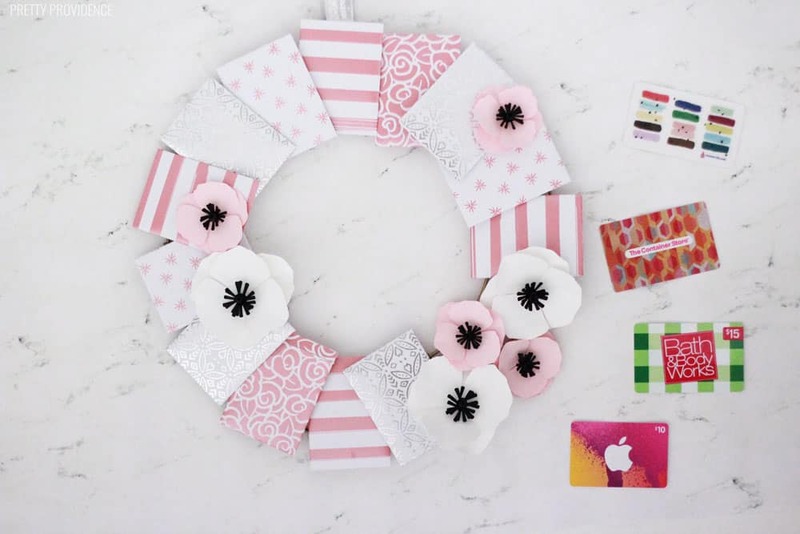 Loving this idea for wrapping gift cards. 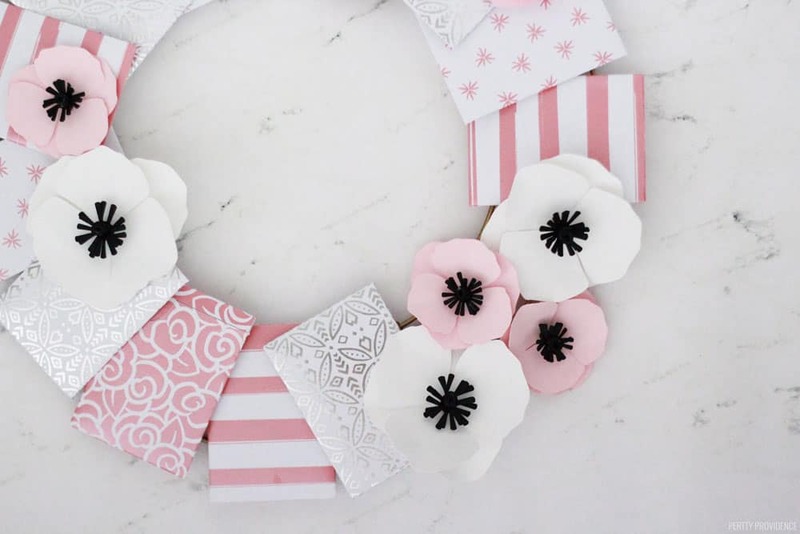 I made this with Mother’s Day in mind, and I can’t wait to make a Christmas version later this year! I hope you’ll try this one next time you’re giving some gift cards!